Trinity College is one of the most popular touristic attractions in Dublin. Thousands of people walk over the campus every day to admire the beautiful buildings of Ireland’s first university, but not many know the historical secrets of the buildings they’re taking photos of. 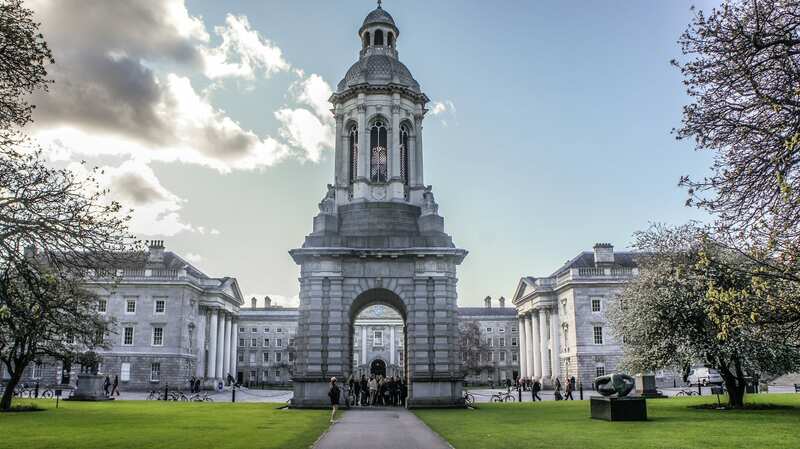 In this blog, we’ll tell you everything you need to know before visiting Trinity College to make sure that you know everything about its rich history. Trinity College is Ireland’s oldest university, founded by Queen Elizabeth in 1592. In 1592 Trinity College only welcomed Protestant elite for education, and only in 1793 it opened its doors to the Catholics. In 1904, the first women were allowed to study at the university. Trinity College is the only Irish university to rank in the top 100 world universities and the top 50 European universities, as rated by The Times. The campus provides dining halls, cafeterias and a bar as well as a varied social life sustained by over 150 student societies and a sports centre and associated sports clubs. The old library of Trinity College is the largest library in Ireland and is built between 1712 and 1732. The library, as a legal deposit, has the rights to receive material published in the Republic of Ireland free of charge. It’s the only Irish library to hold such rights for the United Kingdom. The most famous room in the old library is the long room, this room houses 200,000 of the library’s oldest books. The most famous book of the old library is “The Book Of Kells”. This book is an illuminated manuscript Gospel book written in Latin, containing the four Gospels of the New Testament together with various prefatory texts and tables. It’s mostly famous because it dates back to 800AD and because it is beautifully illustrated. Trinity College was originally built outside the walls of Dublin, which is now in the heart of Dublin’s city centre. There are ‘secret’ tunnels underneath Trinity College but nobody actually knows how to get to them, and whether or not they actually do lead to the Provost’s wine cellar. With an income of 300 million and 700 million value of assets, Trinity College is a billion Euro operation. Knowing the basics of Trinity College its history and its fun facts, you’re more than ready to visit it. The campus is located in Dublin 2, in the middle between O’Connell Street and Grafton Street. It’s also very close to The Davenport, which is located on Merrion Square and a 5-minute walk to Grafton Street. All this is located in the beautiful Georgian Dublin, make sure to read our blog about the secrets of Georgian Dublin.